The wealth of fossilized plesiosaur skeletons testify that these creatures roamed the waters of the past. Recent finds of plesiosaur-like carcasses, on the other hand, have been controversial. Of all plesiosaur-like creatures washed up on shores around the world, basking sharks account for over 90%. The conclusion of the Japanese study published in 1978 on the 1977 Zuiyo-maru carcass trawled off the New Zealand coast, clearly supports identification as a shark. There is evidence, however, for live plesiosaurs in recent times. 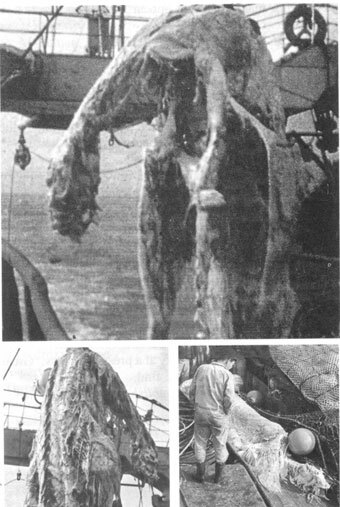 From its find in 1977, the Zuiyo-maru carcass has been the source of controversy. A thorough Japanese report was published in 1978, but confusion about the observations and conclusion of this study still remains today. This is evident from the varied opinions in the many books1–6 articles and reviews,7–10 and letters to editors11–15 relating this find. Controversies surrounding sea creature finds, and more specifically plesiosaur-related ones, are nothing new, however, as they have raged long before the famous Japanese find (see below). 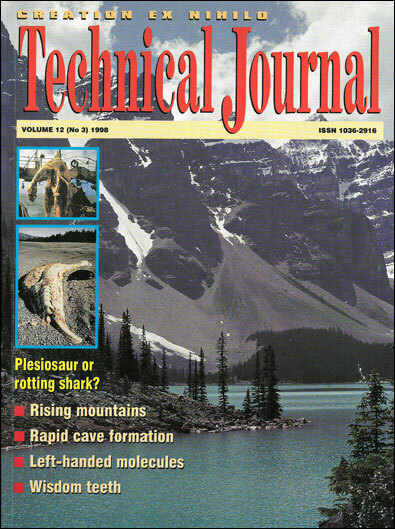 I believe this article is needed to help sort out the confusion in creationist circles concerning the validity of plesiosaur finds, especially the 1977 carcass, as most have not had the opportunity (as I had not) to study all the relevant information systematically. In this article I will provide some pertinent background information, a summary on the most salient points from the published study in 1978, followed by a few independent conclusions from the available data, and then finally my conclusion to the whole issue. Figure 1. Artistic representation of Cryptoclidus. The past existence of plesiosaurs is evident from the wealth of fossilized skeletal remains unearthed worldwide. From the skeletons and from our knowledge of structure and function of various body types from presently living animals, these creatures have been reconstructed, to give us an idea of their appearance and how they may have lived. The order Plesiosauria has been divided into two Superfamilies16: Plesiosauroidea, such as Cryptoclidus (sometimes spelt Cryptocleidus, Figures 1, 2b), characterized by long necks, with 28–71 vertebrae, and small heads, and Pliosauroidea, whose members had large heads and short necks with as few as 13 vertebrae. A huge pliosaur was Kronosaurus (Fig. 2a), whose skull alone was 2.4 meters (8 feet) long. According to evolutionary dating methods they are believed to have lived in the Mesozoic Era, approximately 230–65 million years ago. ‘And God created great whales, and every living creature that moveth, which the waters brought forth abundantly, after their kind, and every winged fowl after his kind: and God saw that it was good. ‘And God blessed them, saying, be fruitful, and multiply, and fill the waters in the seas, and let fowl multiply in the earth. Figure 2. Gross morphology and alignment. b) Reconstructed Cryptoclidus skeleton (after Norman17). c) Basking shark with inset ‘pseudoplesiosaur’ (after Kuban, ref. 10). d) Sketch and proportions of the Zuiyo-maru carcass by Michihiko Yano. The sketch was made from memory, after the carcass had been discarded, and the bones were Yano’s interpolations. Note that the carcass proportions were wrongly portrayed in Yano’s drawing (from Collected Papers on the Carcass of an Unidentified Animal trawled off New Zealand by the Zuiyo-maru, 1978). But are plesiosaurs alive today, or did they become extinct? Many cases of ‘sea creatures’ being washed up on seashores are documented around the world. In a lot of these instances the media hype, preconceived ideas and people’s fascination with monsters have coloured the rational interpretation of the carcasses. in 1960 on the beach at Temma, Tasmania, Australia. When the shark decays, the tissue around the gills breaks apart, so the gills and the lower jaw fall off. This leaves the spinal column and the cranium to resemble a long neck and a small head (Figure 2c). As the bottom of the tail fin has no spinal column, it also decays leaving the appearance of a long tail. Finally the skin sloughs away and the muscles fray out resulting in what resembles a hairy mane. 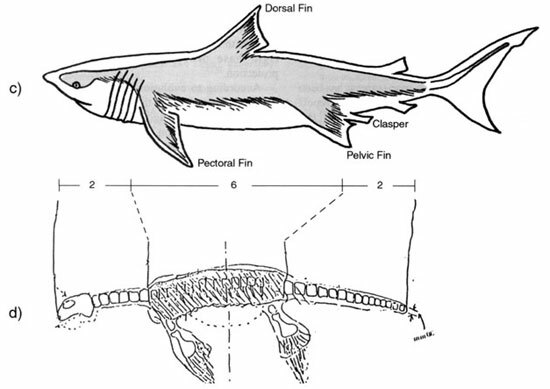 Carcasses have a distinctive plesiosaur appearance, and have been termed ‘pseudoplesiosaurs.’24 The pair of claspers (copulatory appendages) of male sharks may give the appearance of an extra pair of limbs, like that reported for the ‘Stronsay beast’ find. However, when further decayed, they partly merge with the closely associated pelvic fins, making the fins appear larger (see Figure 2c). Figure 3. Photographs taken by Michihiko Yano on 25 April 1977. Top: front view of the carcass. This picture mainly inspired the plesiosaur identification. Bottom left: rear view of carcass. Bottom right: carcass lying on deck. 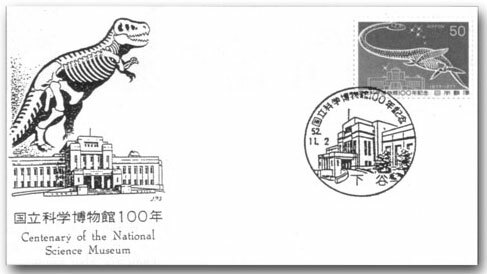 A stamp is issued as follows, in commemoration of the centenary of the founding of the National Science Museum, Tokyo. It was built in 1872, only five years after the Meiji restoration. In 1877, it was enlarged, and moved to the place where it now stands. In 1977 we have its centenary. It is difficult, though, to escape the feeling that a combination of media hype, the view held by some in the scientific community based on Yano’s misleading sketch, and the lack of a thorough analysis of the evidence (an ambiguous interim report was given on July 25 based on chemical analysis of the horny fibre), strongly influenced the design of the stamp. The majority of the findings clearly indicated that the carcass was a decaying basking shark. Below are the most important observations from each study (some shared observations are only mentioned under one research group). ‘ … the anterior limb or fin appears to be articulated at a right angle to the shoulder. Such state of articulation is indicative of a shark’ (see Figure 3a). Lack of neural spine is consistent with selachians (a group of vertebrates which includes sharks and rays). From a reconstruction of carcass based on Yano’s measurements, ‘There are no known fossil reptilian species which agree with the animal under investigation’. Figure 5. 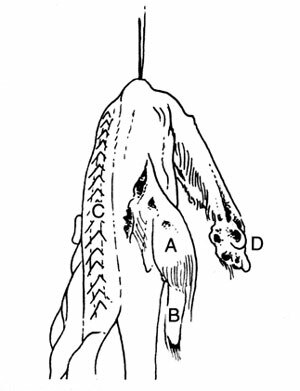 Interpretative sketch of rear view of the carcass in Figure 3c. A. Dorsal fin. B. Right pectoral fin. C. Mycomata. D. Cranium. (adapted from Omura et al.21). ‘There were mycomata in the dorsal muscles.’ Mycomata consist of strong connective tissue between muscle segments and are present in sharks but not in reptiles (see Figure 5). ‘If it were a plesiosaur, the body would not take on the bent posture as shown in the photograph, … because the breast bone is large and flat’ (Figure 3a). Table 1. Amino acid composition of horny fiber from the 1977 Zuiyo-maru carcass and basking shark elastoidin after NaClO treatment. Shown as residues/1000 residues (after Kimura et al.27). similarity in amino acid composition and very low difference index, i.e. ‘43 tyrosine residues/1000 amino acid residues compared to 5 residues or less/1000 residues for collagens’ (see Table 1). The difference in reducible cross-links, ‘which are polyfunctional amino acids derived from lysine, hydroxylysine, and or histidine residues,’ was probably due to decomposition or to destruction from treatment with a too high concentration of NaClO by Yano. Shark-fin processors identified the fibres as ceratotrichia from basking shark fins. Dried ceratotrichia from basking sharks supplied by the Department of Science, Asahi Press, Tokyo, and the isolated fibres showed remarkable resemblance. A few supposed inconsistencies with the shark identification were also noted.28 These, however, have easily been accounted for. The major ones are discussed here. ‘The surface of the body was whitish and covered by dermal fibers which intersecting [sic] each other like in whales and other mammals but were not weak as in fish.’ Fraying of muscle to give the appearance of a bristly or hairy mane is characteristic of basking shark decomposition (see above). Figure 6. Basking shark carcass found on beach south of Kaikoura, NZ. It is clear that if the scientific report had first been published and widely documented prior to the release of the photographs and Yano’s misleading sketch of the creature, more sanity would have prevailed at the time, even in scientific circles. And there would also be less controversy today. Her Seacare leader also related that a basking shark had recently been caught in a net by local fishermen and the skeleton was cartilage and not bone. Was this the carcass that Bev found? Figure 7. 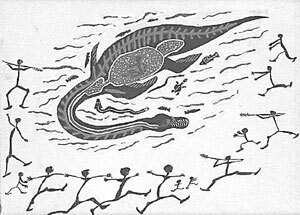 Painting of the plesiosaur-like creature, ‘Yarru,’ by the Kuku Yalanji tribespeople of far North Queensland, Australia. There are many stories and legends of dragons, with descriptions fitting dinosaurs, supporting that man and dinosaur did in fact live together (supporting also a young age for earth).7 Australian Aboriginal folklore abounds with such stories,42 including references to plesiosaur-like creatures. Elders of the Kuku Yalanji Aboriginal tribe of Far North Queensland, Australia, relate stories of Yarru (or Yarrba), a creature which used to inhabit rainforest waterholes.43 The painting in Figure 7 depicts a creature with features remarkably similar to a plesiosaur (compare with Figures 1 and 2a). It even shows an outline of the gastro-intestinal tract, indicating that these animals had been hunted and butchered. It would not surprise me at all if a live plesiosaur was found today. The fossil record is indeed incomplete, but this really means that it lacks the countless transitional forms that Darwin predicted. But a thorough investigation of fossils clearly demonstrates that evolutionary metamorphosis from one animal type to another has not occurred. Instead of many transitional stages, there is only a handful of debatable ones. Many fossilized insects and animal fossils are identical to those living today. When sin entered the world death followed, and a perfectly balanced ecosystem, based mainly on a vegetarian subsistence was destroyed. As seen today, animal and plant species are constantly dying out and there is an escalating number in the ‘endangered species’ list. The finding of a live plesiosaur would certainly be another evolutionary headache. God has already revealed fauna and flora that were believed extinct, confounding evolutionary-atheistic thinking. 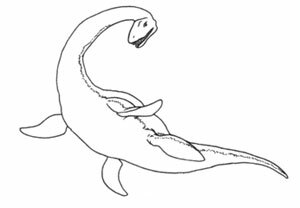 We may all hope to find a live plesiosaur, and there is some evidence to support that these creatures roamed the waters in recent times (see below). But to ground our belief on spurious finds such as the Zuiyo-maru carcass, choosing to ignore the weight of evidence for decomposing sharks, is great folly. God gives unequivocal evidence in His chosen time, as is seen with the finding of live Coelacanths, Tuatara, etc. We are not ‘helping’ God and the Gospel of Jesus Christ if we are seen by unbelievers to hold on to unfounded claims ‘ … be ye therefore wise as serpents, and harmless as doves’ (Matthew 10:16). Note: CPC refers to Collected Papers on the Carcass of an Unidentified Animal trawled off New Zealand by the Zuyo-maru, Edited by T. Sasaki, La Société Franco–Japonaise d’Océanographie, Tokyo, pp. 45–83, 1978. Taylor, P.S., The Great Dinosaur Mystery and the Bible, Chariot Books, David C. Cook Publishing Co., Elgin, Illinois, pp. 46–47, 1987. Return to text. Unfred, D., Dinosaurs and the Bible, Huntington House, Lafayette, Louisiana, p. 34–35, 1990. Cited in Niermann, Ref. 7, p. 102. Return to text. Taylor, I.T., In the Minds of Men, TFE Publishing, Toronto, pp. 106–107, 1984. Return to text. Heuvelmans, B., In the Wake of Sea Serpents, Hill and Wang, New York, 1968. Cited in Kuban, Ref. 10, p. 19. Return to text. Bright, M., There are Giants in the Sea, Roleson Books, London, pp. 180–184, 1989. Return to text. Shuker, K.P.N., In Search of Prehistoric Survivers, Blandford, London, pp. 98–99, 1995. Return to text. Niermann, D.L., Dinosaurs and Dragons, CEN Tech. J., 8(1):85–104, 1994. Return to text. Wood, T.C., Zuiyo-maru carcass revisited: plesiosaur or basking shark?, CRSQ 33(4):292–295, March 1997. Return to text. Anon., Queries and comments, Origins 21:24–25, July 1996. Return to text. Kuban, G.J., Sea-monster or Shark? 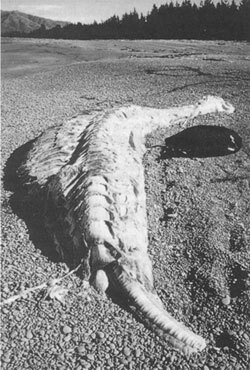 An analysis of a supposed plesiosaur carcass netted in 1977, National Centre for Science Education, Reports 17(3):16–28, 1997. Return to text. Boyle, T.D., Letter to the editor, CEN Tech. J. 8(2):155, 1994. Return to text. Chui, C., Letter to the editor, CRSQ 34(4):252, March 1998. Return to text. Wood, T.C., Letter to the editor, CRSQ 34(4):252–253, March 1998. Return to text. Bowden, M., Letter to the editor, CRSQ 34(4):254–255, March 1998. Return to text. Jang, A.W., Letter to the editor, CRSQ 34(4):256–258, March 1998. Return to text. Dixon, D., Cox, B., Savage, R.L.G. and Gardiner, B., The Macmillan Illustrated Encyclopedia of Dinosaurs and Prehistoric Animals, Macmillan Publishing Co., New York, pp. 76–77, 1988. Return to text. Norman, D., The Illustrated Encyclopedia of Dinosaurs, Salamander Books Ltd., London, pp. 178–179, 1985. Return to text. Bright, Ref. 5, pp. 180–181. Return to text. Bright, Ref. 5, p. 183. Return to text. Bigelow and Schroeder, Fishes of the Gulf of Maine, United States Government Printing Office, 1953. See <www.mbl.edu/html/MISC/basking.html>, p. 3. Return to text. Omura, H, Mochizuki, K. and Kamiya, T., Identification of the carcass trawled by the Zuiyo-maru from a comparative viewpoint. In CPC, p. 59, 1978. Return to text. Bright, Ref. 5, pp. 182–183. Return to text. Bigelow and Schroeder, Ref. 20, p. 2. Return to text. Cohen, D., The Encyclopedia of Monsters, Dodd, Mead and company, New York, 1982. Return to text. Sasaki, T., Foreword. In CPC, n.p. 1978. Return to text. Koster, J., Creature feature, Oceans 10:56–59, November 1977. See <http://www.gennet.org/facts/nessie.html>, p. 2. Return to text. Kimura, S., Fujii, K., Sato, H., Seta, S. and Kubota, M., The morphology and chemical composition of horny fiber from an unidentified creature captured off the coast of New Zealand. In CPC, p. 67, 1978. Return to text. Obata, I. and Tomoda, Y., Comparison of the unidentified animal with fossil animals. In CPC, pp. 49, 1978. Return to text. Jang, A.W., Personal communication, 10 August 1998. Return to text. Obata, I. and Tomoda, Y., Ref. 28, pp. 45–54. Return to text. Hasegawa, Y. and Uyeno, T., On the nature of the carcass of a large vertebrate found off [sic, of] New Zealand. In CPC, pp. 63–66, 1978. Return to text. Kimura et al, Ref. 27, pp. 67–74. Return to text. Abe, T., What the giant carcass trawled off New Zealand suggests to an ichthyologist. In CPC, pp. 79–80, 1978. Return to text. Steel, R. Sharks of the World, Facts on File Publications, New York, 1985. Cited in Kuban, Ref. 10, p. 25. Return to text. Seta, S., On the condition of the carcass of the unidentified animal. In CPC, pp. 75–76, 1978. Return to text. Hasegawa and Uyeno, Ref. 31, p. 65. Return to text. Seta, Ref. 35, p. 76. Return to text. Obata and Tomoda, Ref. 28, p. 53. Return to text. Elliott, B., Letter to CMI ministries, 7 February 1997. Return to text. Elliott, B., Letter to CMI ministries, 3 March 1997. Return to text. Kuban, Ref. 10, p. 18. Return to text. Shuker, K., The Unexplained, Carlton Books, London, 1997. Return to text. Kuku Yalanji tribespeople, Personal communications to CMI ministries, 1998. Return to text. McLaughlin, Dehne, Email communication to CMI ministries, 1 December 1998. Return to text.